Here are some of our more popular wedding dress styles this season giving you the most exquisite look for an unforgettable wedding day. 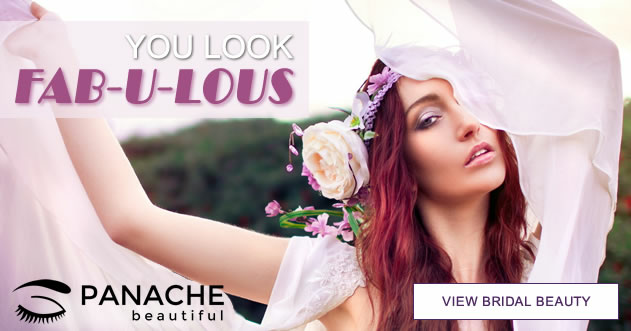 Panache Bridal Boutique is privileged to have a beauty salon on site where we can offer a wide range of beauty treatments including bridal make-up to help prepare you in the lead up to your wedding day. We like to offer everything you could need to ensure you are looking and feeling fantastic on your special day. Why not call us today for more details on what we offer glamorous brides-to-be. Formal, sophisticated, and full-on glamorous, a black tie wedding is the epitome of elegant chic. In this wedding dress with it's stunning Linear Lace curve, hugging fit and flare gown you will definitely stand out from the crowd at your stunning soiree!